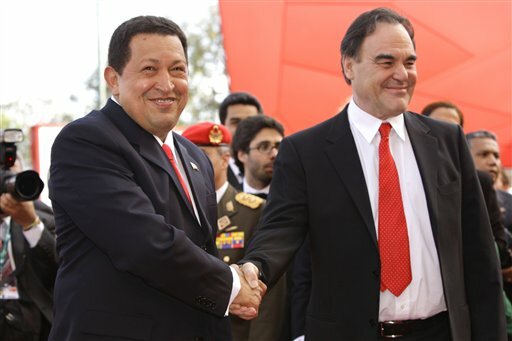 Venezuelan President Hugo Chavez walked the red carpet alongside film director Oliver Stone on Monday at the Venice Film Festival for the premiere of Stone's documentary, "South of the Border," which features interviews with Chavez and several other progressive leaders in South America. Through one-on-one and group interviews with the presidents of Venezuela, Brazil, Bolivia, Ecuador, Argentina, Cuba, and Paraguay, the full-length documentary seeks to reveal the truth beyond the distorted portrayals of these leaders in the mainstream media in the U.S. and around the world. "I think he is an extremely dynamic and charismatic figure. He is open and good-hearted, as well as a fascinating personality," Stone said of Chavez. "But when I return to the U.S. I only hear these stories about the 'dictator,' the 'bad man,' the 'threat to American society.'" Stone added that "the film was a liberating experience," and that Chavez "was the first Latin American head of state who challenged the International Monetary Fund... for that I consider him a hero." A large crowd of supporters held up signs, asked for autographs, and cheered for Chavez as he arrived at the festival. Greeting reporters, Chavez quoted the Uruguayan writer Mario Benedetti. "Like Benedetti said, the South exists too," he said. "In this festival the South is placed on the highest levels with Europe and the world, with high quality and a great respect for the truth." "There is a renaissance underway in Latin America, and [Stone] has captured this renaissance, which is spiritual and moral first and foremost, with his camera and his genius," Chavez told an Italian news agency through a translator. Stone said the South American leaders featured in the film have more in common than the press reports. "The press in America has divided the Latin American continent into the 'bad left' and the 'good left,'" he said. "They have labeled [Ecuadoran President Rafael] Correa as the bad left, along with [Bolivian President Evo] Morales and Chavez, and they call Lula [da Silva, the president of Brazil] the good left... I think these differences are erroneous." Writer Tariq Ali, who collaborated with Stone to write the script of the documentary, said, "the idea is to show the U.S. public who these presidents are so they can decide, form their own opinion." "In Bolivia, Venezuela, and Ecuador, there are governments that are using their countries' resources to help the poorest people. In the past, the poor were invisible," Tariq Ali added. A previous documentary about Venezuela that grabbed international attention was "The Revolution Will Not Be Televised." Released in 2003, the film revealed key video footage from the April 2002 coup d'etat that the mainstream media had omitted in an apparent attempt to implicitly justify the coup.